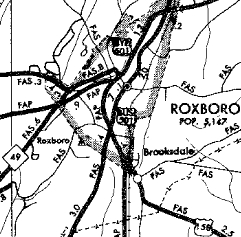 Formerly: The first US 501-A was born between 1945-49 as a renumbering of US 501 on Main St through Roxboro. 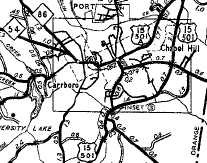 In 1960, US 501-A became US 501 Business. Today Main St is unnumbered. 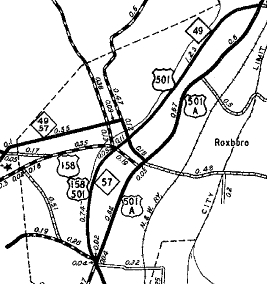 The 2nd US 501-A was born in 1953 as a renumbering of mainline US 15-501 through Chapel Hill when US 15-501 was placed on the eastern bypass of Chapel Hill. US 501-A was renumbered as US 501 Business in 1960. 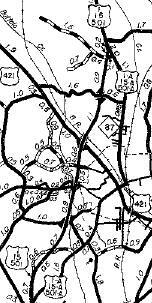 Today it is part of NC 86 and also Franklin St. 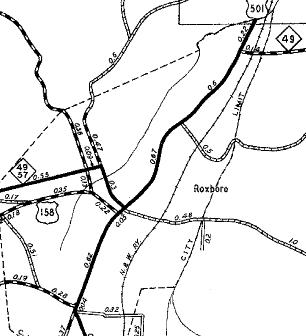 US 15-501 Business replaces 15A-501A. 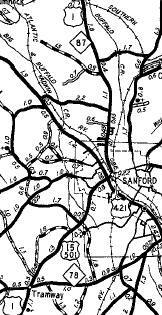 The 3rd US 501-A was born in 1956 when US 1-15-501 was put on a western bypass of Sanford. In 1960 this was renumbered as US 1-15-501 Business. 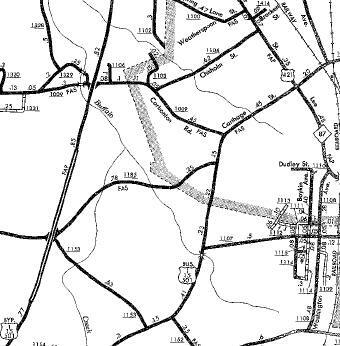 Today it is just US 1 Business and below NC 42 just Carthage St.